The blue-footed booby is a strictly marine bird, distributed among the continental coasts of the eastern Pacific Ocean from California to the Galápagos Islands down into Peru. 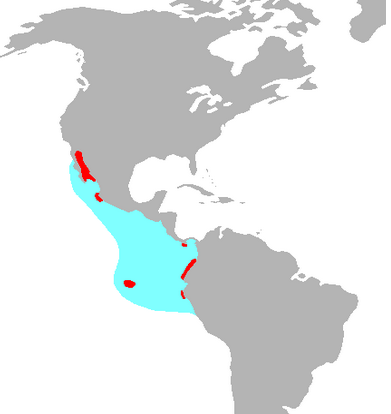 It only uses land to breed and rear young, which it does along the rocky coasts of the eastern Pacific. It forages in cool, offshore waters, and nests on open ground on rocky coasts, cliffs or islands. The underparts are white, and the tail is dark brown, with white central feathers. The wings are long and pointed. The beak of the blue-footed booby is dark greenish-blue or grey, merging into the dark skin of the face and gular pouch, and the eye is a piercing yellow. Both sexes look pretty much the same, although females can be distinguished by the dark inner iris in the eye, giving the appearance of a larger pupil. As aforementioned, they are also slightly larger but have a proportionately shorter tail. Young individuals are more uniform brown on the head, neck, upperparts and upper breast, with a white belly, duller legs, and brown or greyish eyes. Currently there are two recognized subspecies: Sula nebouxii nebouxii, and the larger and paler Sula nebouxii excisa. In the wild their average life span is about 17 years. and is smaller in size than the female. The blue color of the blue-footed booby's webbed feet comes from carotenoid pigments obtained from its diet on fresh fish. Carotenoids act as antioxidants and stimulants for the blue-footed booby's immune function, suggesting that carotenoid-pigmentation is an indicator of an individual's immunological state. 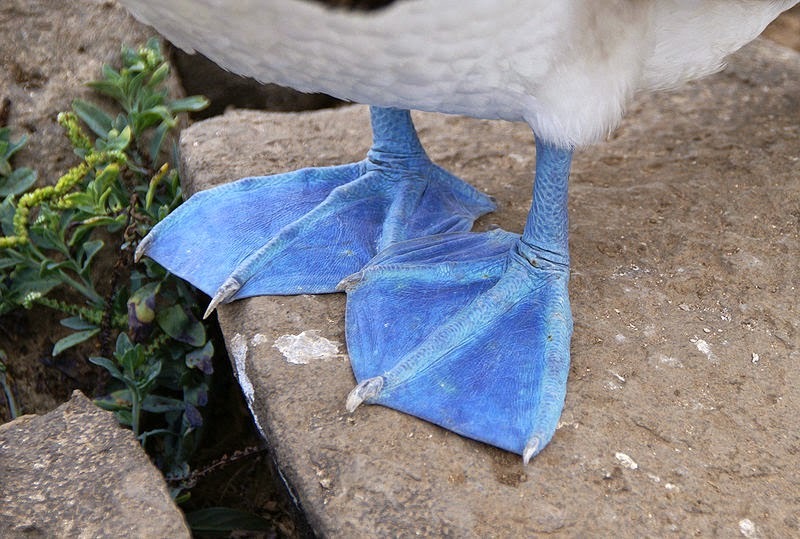 Blue feet are also indicative of the health condition of an individual. Boobies who were experimentally food-deprived for forty-eight hours experienced a decrease in foot brightness due to a reduction in the amount of lipids and lipoproteins that are used to absorb and transport carotenoids. Thus, the feet are rapid and honest indicators of a booby's current level of nourishment. 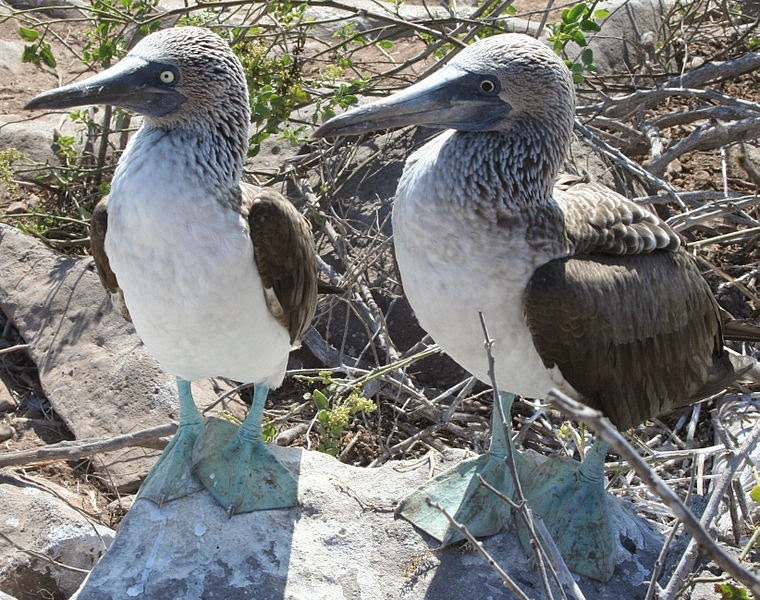 As blue feet are signals that reliably indicate the immunological and health condition of a booby, coloration is favored through sexual selection. The distinctive blue feet ! Their diet primarily consists of fish. This includes small school fish like sardines, anchovies, mackerel, and flying fish. Blue boobies also feed on squid and offal. They dive into the ocean, sometimes from great heights, and can swim underwater in pursuit of prey. They hunt singly, in pairs, or in larger flocks. Boobies travel in parties of about 12 to areas of water with large schools of small fish. When the leader sees a fish shoal in the water, it signals to the rest of the group and they all dive in unison, pointing their bodies down like arrows. The species is monogamous, although it has the potential to be bigamous. It is an opportunistic breeder, with the breeding cycle occurring every 8 to 9 months. 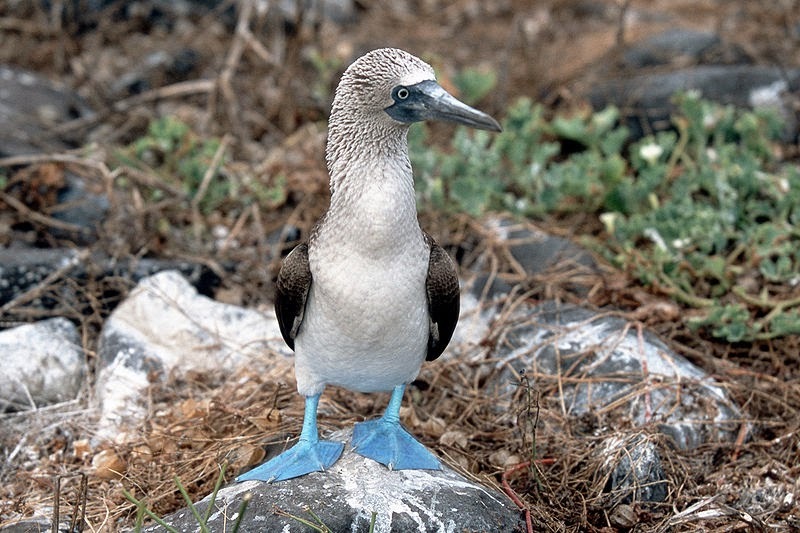 The courtship of the blue-footed booby consists of the male flaunting his blue feet and dancing to impress the female. The male begins by showing his feet, strutting in front of the female. Then, he presents nest materials and finishes the mating ritual with a final display of his feet. The dance also includes "sky-pointing", which involves the male pointing his head and bill up to the sky while keeping the wings and tail raised. 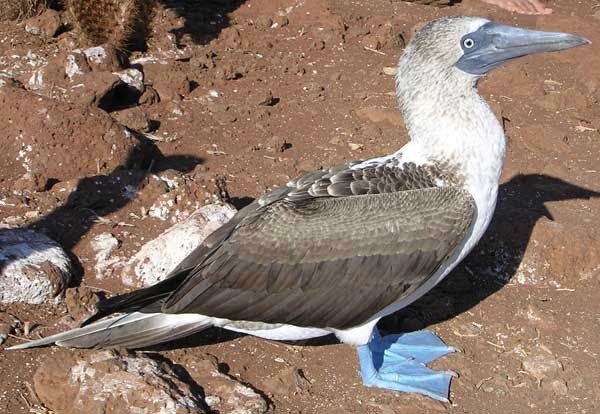 The blue footed booty is currently listed under least concern, due to its large range and overall large and healthy populations. The population trend appears to be stable. Blue-footed booby (Sula nebouxii) in the Galápagos Islands.